I received an order for 3 hats. I finally was able to get them made up. 2 for girls and 1 for a boy. I really need some head mannequins. My poor son having to model for me. I used a size H hook and Caron Simply Soft thread. 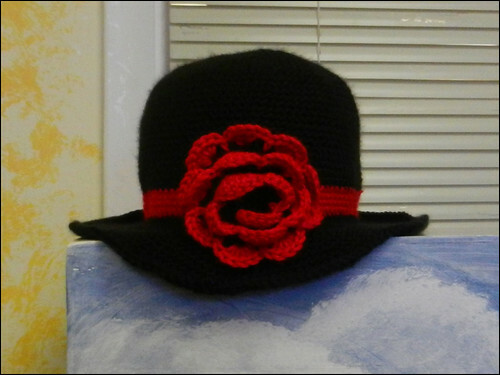 For the flower hat, I used a pattern from RAKJ Patterns called Sweet & Sassy. The caps were loosely based on 3 boys & a ball of yarn‘s pattern called ribbed baseball hat. The flower is from Cult of Crochet flower headband and the Hello Kitty face, I simply crocheted an oval, added ears, embroidered eyes and nose and sewed it on the hat. Except for the picture of the Hello Kitty, I took these with my iPad. I’m wishing I had taken them with the camera. I will try to get some pictures indoors with the camera, they may turn out better. I’m really hoping that they’ll fit. Another lovely Groovy Granny. I am so enjoying coming up with different color combinations. 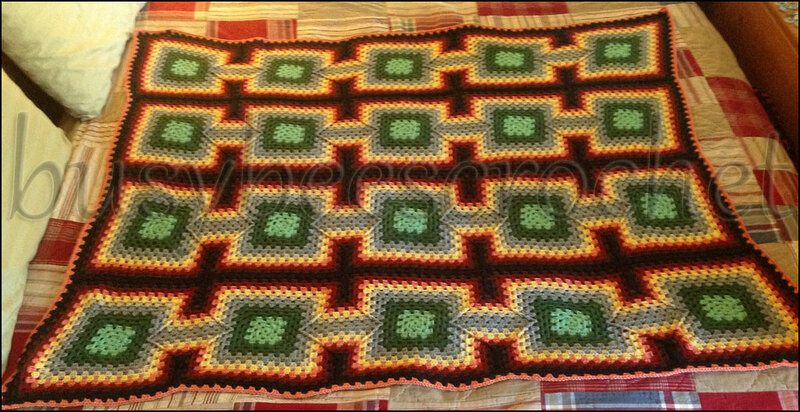 🙂 This blanket is for sale in my Etsy Shop. This is another Groovy Granny that I made that I gave to my cousin Jill and her husband, Jonathan, for a wedding gift. An online friend of mine and his wife are having a baby and I wanted to make a blanket for them. I don’t often do the traditional baby blanket, unless it’s asked of me, and this was no exception. 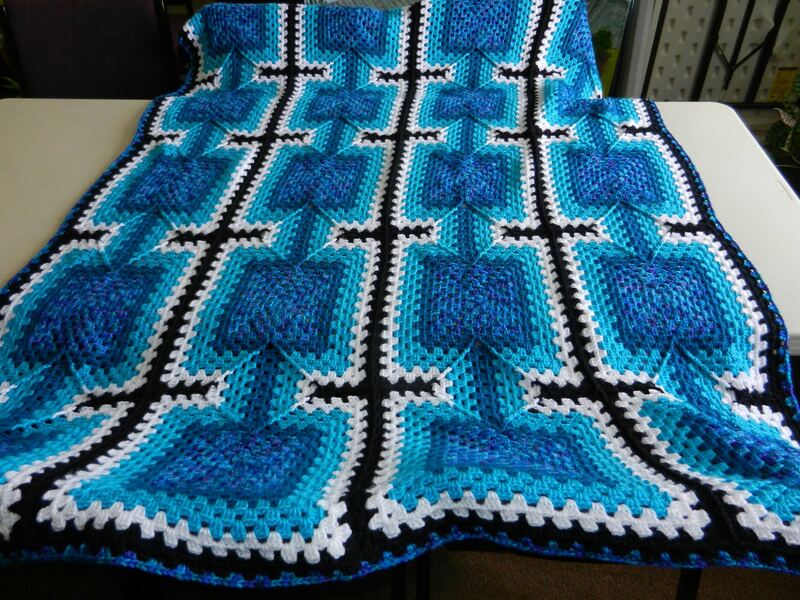 This beauty was made using Caron Simply Soft in Oceana, white, black, mint and ocean. I used a pattern found in Herrschner’s Blue-Ribbon Afghans (Crochet Treasury) and it is currently my favorite pattern. For more photos, please view it’s flickr page. 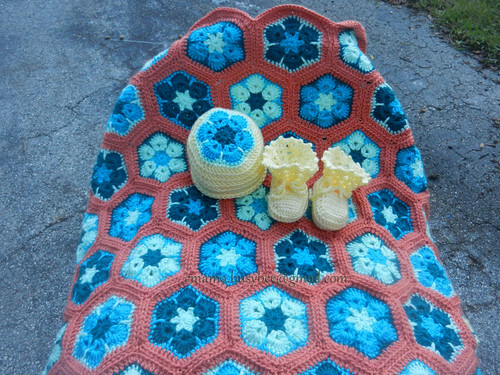 A friend commissioned me to make a baby blanket, hat and booties for a co-worker. I liked the African Flower motif that I used for my bag (designed by NillaK), and I chose the blues/greens and an orange because she didn’t want typical baby pastel colors. 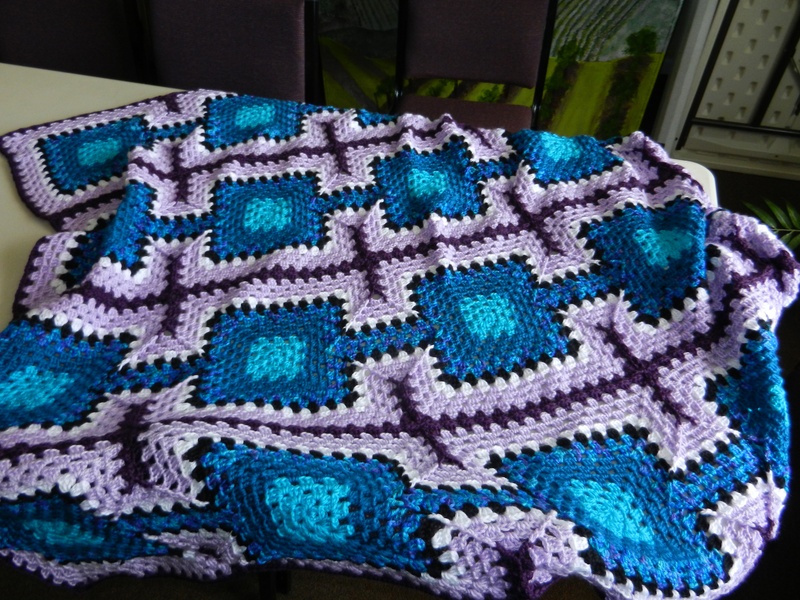 I found a 1/2 motif (designed by Leslie Stahlhut) that I used on 2 sides of the blanket. 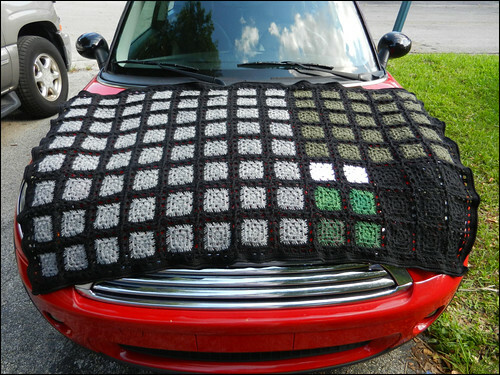 The blanket measures 33″ x 34.5″. I used the whole motif to create the hat as well and found the booties in a booklet I have. I wanted a fun way to use up some of my yarn and ended up with a fun, geeky way. I found a tile layout with Fibonacci number sized squares and made my blanket according to this. It is about 60″ x 38″. This item is currently for sale in my Etsy shop. You can view more details on its Flickr page with links to the image I used as a layout inspiration and also the pattern I used to connect the squares. So, I have become quite lazy when it comes to blogging about my projects. I try to keep track on Ravelry, Facebook, Flickr – I just want to crochet! A friend of mine commissioned me to make a hat for her niece. I make one up using black and red Caron Simply Soft and an I hook. I do not have a head mannequin so I had to use my 8-year-old son’s head as a model. It ended up being a little big. I will make up another one using a smaller hook. I used this pattern for the flower. I was very happy with how it turned out, just that it was a little too big. ch 3, dc in same st, dc in next st, 2dc in next dc, *ch 2, 2dc in next dc, dc in next dc, 2 dc in next dc around. join with sl to first dc. repeat pattern for 3 more rounds to increase diamond shape – 2dc in first and last stitches of each group with 2 ch between. ch 2, dc in next dc (counts as beg dc dec), *dc in each dc, stopping at last 2 dc, dc dec over next 2 dc, ch 5, sc in ch 5 sp, ch 5, dc dec over next 2 dc, dc in each dc stopping at last 2 dc, dc dec over next 2 dc, ch 2, dc, ch 5, dc in 3rd ch of ch 5, ch 2, dc dec around, join with sl st in first st.
beg dc dec, *dc in each dc stopping at last 2 dc, dc dec over next 2 dc, dc dec over next 2 dc, ch 5, sc in ch 5, ch 5, sc in ch 5, ch 5, dc dec over next 2 dc, dc in each dc stopping at last 2 dc, dc dec over last 2 dc, ch 2, 2 dc, ch 2, 2 dc, ch 2, 2 dc in ch 5 sp, ch 2, dc dec around, join with sl st in first st.
beg dc dec, *dc in each dc stopping at last 2 dc, dc dec over next 2 dc, dc dec over next 2 dc, ch 5, sc in ch 5 (3 times), ch 5, dc dec over next 2 dc, dc in each dc stopping at last 2 dc, dc dec over next 2 dc, ch 2, shell (2 dc, ch 2, 2 dc) in ch 2 sp of first shell, shell in ch 2 sp of second shell, ch 2, dc dec around, join with sl st to first st.
beg dc dec, *dc, dc dec, ch 5, sc in ch 5 sp (4 times), ch 5, dc dec, dc, dc dec, ch 2, sh in sh, ch 2, sh in sh, ch 2, dc dec around, join with sl st in first st.
sc around an elastic hair band, sc in each dc and dc dec, 3 sc in each ch 5 space, in the shell section, space 5 sc across. join with sl st in first sc. sc in first sc, *2 sc in ch 5 space, ch 4, sc in next sc, around, sl st in first sc. *sc in next sc and in each sc before the ch 4, 2 sc in ch 4 space, ch 4, skip sc around. sl st in first sc. 43 days ago, I embarked on a journey to change the way I eat. I started a diet taking in only 500 calories a day along with a hormone, HCG. I have lost 26 lbs. I cut out sugar and fat and most starches. Three days ago, I stopped taking the hormone and tomorrow I start taking in at least 1500 calories, still avoiding sugar and starches and trying to maintain my weight for 3 weeks. After 3 weeks, I will re-introduce sugars and starches slowly back into my diet, being careful not to gain weight. Then at the end of those 6 weeks, if I desire to lose more weight, I start over. I’m a little nervous about this next phase. I’m hoping that I’ll be able to keep track of the calories and figure out how to eat while maintaining a weight. I’m excited to be able to eat more foods and excited to see where this will lead. But change is difficult so I just hope that I’m able to do this.